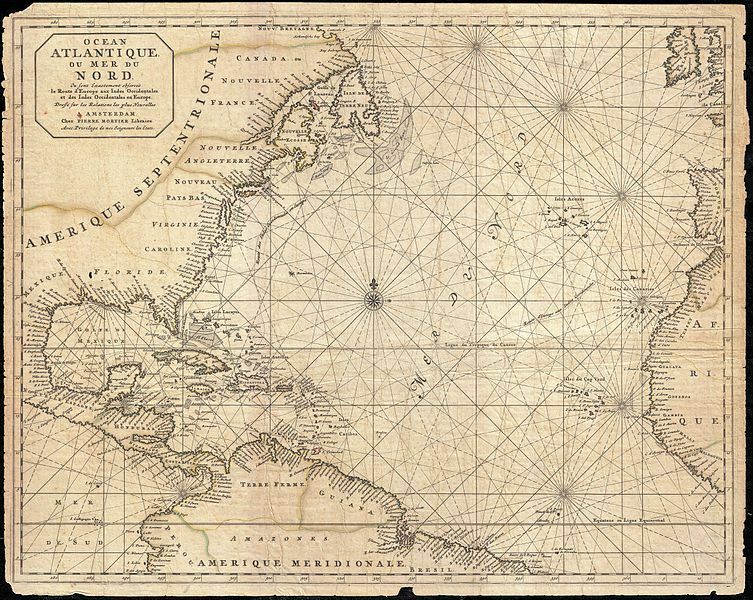 Map of North America, the West Indies, and the Atlantic Ocean, by P. Mortier, 1693. Slave traders in Gorée, Senegal, by Jacques Grasset de Saint-Sauveur, ca. eighteenth century. Slavery, plantation agriculture, and the major cash crop of rice all came to Charleston and the surrounding Lowcountry region through a larger Atlantic World trade and migration system. To fully comprehend Charleston's colonial and antebellum history of slavery, trade, and plantations, we must look beyond the city, region, and even North America, to include the trans-Atlantic exchanges and influences of a complex multicultural and multinational network. Before the fifteenth century, the Atlantic Ocean proved to be a barrier between the populations and cultures of West and Central Africa, Western Europe, and the Americas. Though southern Europeans and northern Africans along the Mediterranean Sea shared a long history of interaction through trade or conflict, African and European maritime trading networks did not extend along the Atlantic coast of Africa into the continent's western and central regions until the fifteenth century. Ancient overland trade networks between Europe and western and central Africa have a much longer history, but they did not match the volume and speed of later maritime routes. By improving overseas navigation in the fifteenth century, European explorers and entrepreneurs rapidly increased trade and multicultural exchanges with Atlantic African populations ranging from small nations and kinship groups to complex African empires. 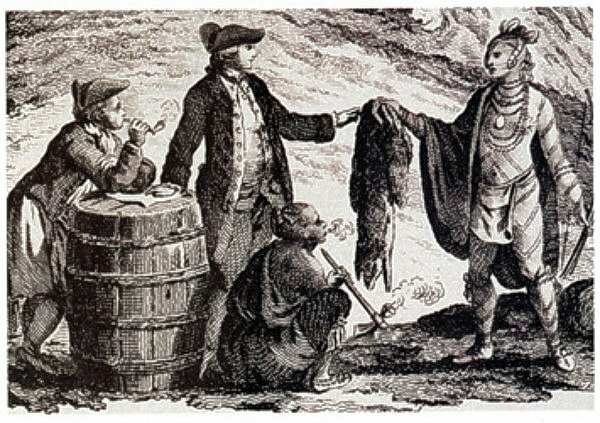 European and American Indian fur traders in Canada, drawing by William Faden, 1777, courtesy of the Library and Archives Canada. By the end of the fifteenth century, European explorers could navigate difficult currents and winds to not only travel down the coast of Africa, but also to cross the Atlantic Ocean to the Americas. Their goal was to find a western trade route to Asia because the growing Ottoman Empire blocked the eastern route. Instead, these explorers encountered the Americas, and in the centuries that followed the Atlantic Ocean transformed from a barrier into a corridor of trade and migration — both voluntary and forced. New trans-Atlantic maritime routes launched an unprecedented level of interaction between Africans, American Indians, and Europeans. The numerous encounters, conflicts, and collaborations that resulted from these interactions became known as the Columbian Exchange or the Grand Exchange — a massive movement of animals, plants, human populations, diseases, and ideas that would forever transform the diverse nations and societies of the Atlantic World. 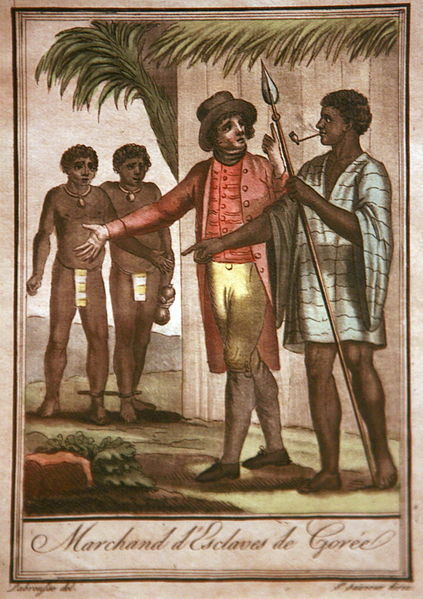 While the traditional labor systems, religious beliefs, military rivalries, and social hierarchies of these formerly separate Atlantic World regions remained influential in the New World, each cultural group also underwent dramatic changes in emerging multicultural contexts surrouding trade, migration, and colonization. 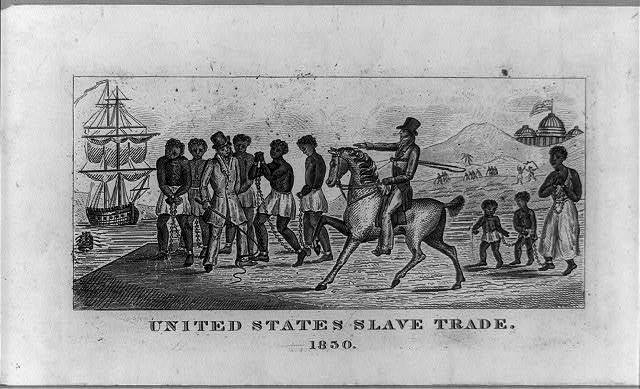 United States Slave Trade, engraving, 1830, courtesy of the Library of Congress. In the fifteenth century, Europeans seeking economic gain through trade, colonial expansion, mining, and plantation agriculture effectively launched this massive Atlantic World exchange. To make their various economic pursuits in the Americas profitable on growing trans-Atlantic markets, elite and entrepreneurial Europeans required land, widespread trading networks, and significant labor resources. They displaced indigenous people from their traditional territories in the Americas to access new land, and developed labor systems like European indentured servitude and African and American Indian slavery to fill their growing labor needs. For many Africans and American Indians, new encounters with Europeans in the Atlantic World meant conflict, violence, and oppression. 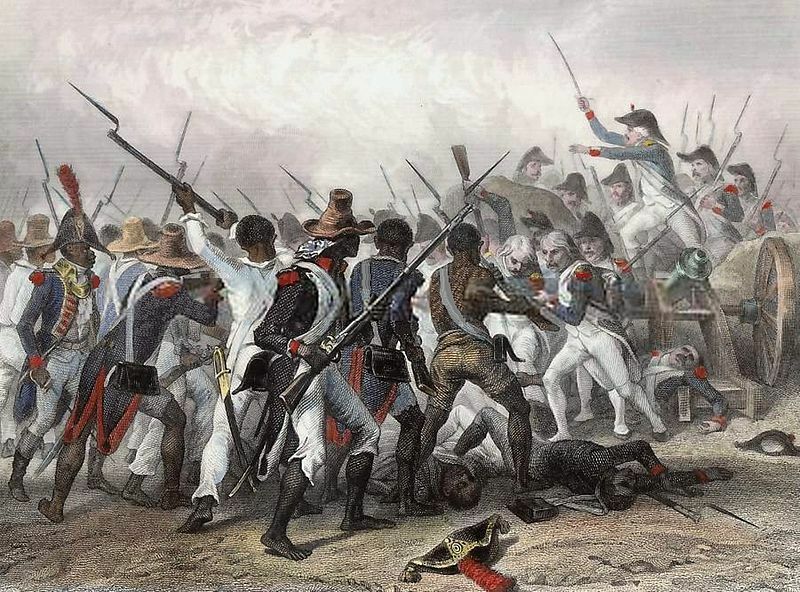 Scene of the Battle of Vertières during the Haitian Revolution, engraving, 1845. Still, Native Americans and Africans proved far from passive in this New World transformation. In the Americas, Africans and American Indians consistently resisted European-imposed racial hierarchies and enslavement, and carved out spaces for their own political, social, economic, spiritual, and cultural needs and identities. In this way, the diverse cultural groups of the Atlantic World each played significant roles in shaping the multicultural societies that emerged in the coming centuries. Today, the history of the Atlantic World cannot be fully understood without including the multicultural experiences and influences of American Indians, Africans, and Europeans, formed through collaboration and exchange, as well as conflict and oppression, in the New World. The growth of the trans-Atlantic slave trade and chattel slavery in the Americas, particularly for people of African descent, exemplifies how older labor systems and racial beliefs transformed with New World economic, political, and social developments. This exhibition, Atlantic World Context, the first in the African Passages, Lowcountry Adaptations series, outlines the broader context of the Atlantic World that would eventually shape Charleston and the Carolina Lowcountry's early colonial history, with a particular focus on the rise of chattel slavery and the growth of plantation agriculture.